Createspace Independent Publishing Platform, 9781478301974, 88pp. If You Can Breathe, You Can Meditate: A Practical, Secular How-To Guide to Meditation is an indispensable new book that demystifies the practice of meditation, stripping away religious and philosophical associations that have been ascribed to this timeless and universal activity. It brings clarity and focus to something that is entirely normal, completely human, and positively habit-forming. Meditation is not magic, nor is it a religion. It will not allow you to break the laws of physics and levitate or visit astral realms. Meditation is simply a process of focused objective attention--a mental exercise, nothing more and nothing less. While it is often lumped together with mysticism or appropriated by New Age believers alongside their chakras, crystals, and auras, meditation is in fact a straight-forward, secular practice that can help to improve your health and quality of life. Among the potential benefits of meditation are relief from stress, anxiety, and depression, lowered blood pressure, reduction in cholesterol levels, effective pain management, improved sleeping patterns, increased energy, and enhanced creativity and intuition. A skeptic by nature and a scientist by training, author Morgan D. Rosenberg brings a refreshingly direct and pragmatic perspective to this plain and practical instruction manual for those interested in meditation. 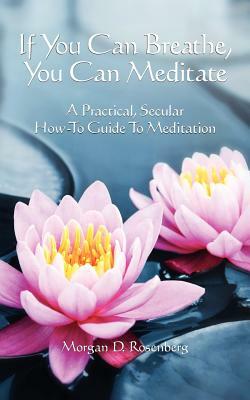 Broken down into a series of step-by-step chapters, If You Can Breathe, You Can Meditate guides the reader through the various aspects of meditation, providing convenient, easily referenced resources including a section addressing frequently asked questions and a comprehensive bibliography that will assist with further investigation and reading on the subject. Dispel your misconceptions and discover the realities of meditation and mindfulness, as this thoughtful and insightful guide presents a practical way to engage in a beneficial routine of mental exercise rooted in the fundamental, reasonable principles of meditation. Morgan D. Rosenberg has a lifelong interest in meditation and practices meditation as part of his normal routine. His personal investigation of Zen has included travel in Japan and led to his writing a book entitled, Dark Buddhism: Integrating Zen Buddhism and Objectivism, published in 2011. A physicist by training and vocation, Rosenberg holds a graduate degree in physics from the University of Maryland, and his scientific work has been recognized with the Society of the Sigma Xi award, the Dr. Robert H. Goddard award, the Bausch and Lomb Science Medal, and the Allied-Signal Science Award. He is a member of Mensa, and is also the author of The Essentials of Patent Claim Drafting, Business Method and Software Patents: A Practical Guide and Patent Application Drafting: A Practical Guide.